Have you ever dreamed of becoming a painter? 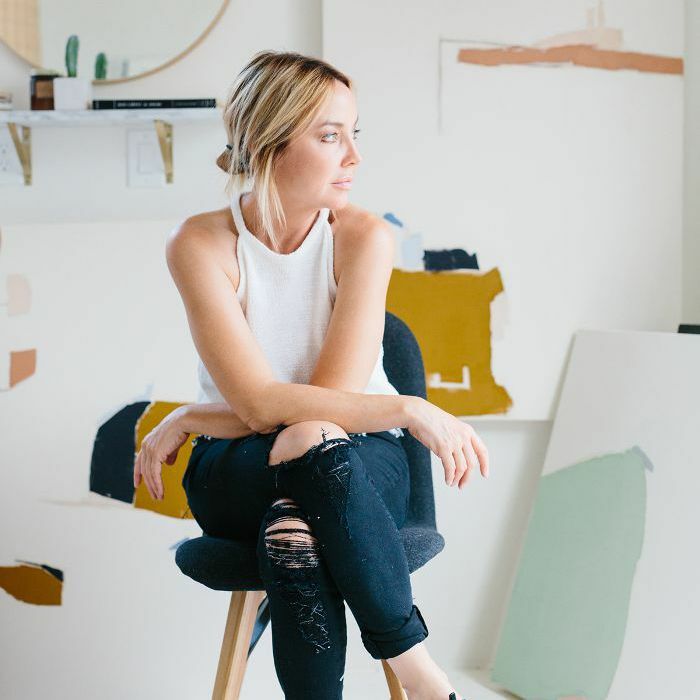 Well, you might consider taking it up as a hobby if not a career after stepping into the striking studio of Salt Lake City artist Holly Addi. There are people among us who lead an inspired life and pursue a creative path without exception, and Addi is one of those who constantly inspires and motivates me. You might recognize her incredible work from my Los Angeles living room makeover. As soon as I set eyes on on the piece I have, I knew it would transform our space and really set the tone for the new design. It's now the talking point of our home, and I don't know how many people have messaged me on Instagram asking who made it. Addi has been creative since childhood, but she actually studied psychology at the University of Utah first. "I continued to paint throughout this time, but viewed my studies as a necessary part of my future artistic life as psychology is the backbone of the artist's mind," she tells me. Post-college, Addi opened a high-end floral shop and despite the nationally recognized success, she finally chose to go back to her roots and start painting full time rather than expand the business further after 15 years. She hopes this decision and major career leap will inspire other talented creatives to do the same. "I think it's really important as an artist to nurture your talent and not let anyone turn that light off," she says. "Art takes digging deep." So take a step inside Addi's studio and we guarantee you'll pick up a brush and start painting too. How important is the design of your studio for conjuring the creativity and inspiration? "Oh wow, being an artist and merely a creative in general, I would have to say my existence literally feeds off of the design. To be honest, how is an artist supposed to keep their space a meditative vision of this clean, minimal, layered, refined, beautifully kept masterpiece with a showroom-quality aesthetic that is worthy of having clients enter and at the same time, be able to dive into the depths of paint splattering about and bits of charcoal strewn about the floor? "I needed both, so I literally split my studio in half. That is how important it is to me. My boyfriend thinks I am an insane creature, but for me, it works, and that's all I need. As you enter my 600-square-foot studio, it is beautiful and all white with minimal accents of color, old warehouse windows with amazing light, a handmade rattan chandelier, white floor cushions, and very clean lines with minimalist elements, I guess mimicking my art to some extent. "Then I have two Belgian linen curtains that separate the space that lead to what I call Hell's Kitchen, aka the separation from wonderland. I guess it would be like the clean white car that has a nice aesthetic and air conditioning, and if you opened the center console, well, let's just say you can't. Make sense? "Hell's kitchen is a simple place I have all to my own. Behind those Belgian linen panels, there is a deep understanding and that this is where the work gets done. I really don't let many people in there. It's my personal area of work that just works. There can be meltdowns and moments of amazement, and both happen at the same pace and sometimes all within the same 10 minutes." What was the vision for the space? "I wanted it all white, a place where I could do more than just work but exist with my work and relax, meditate and come up with collections of art that didn't have any sway from their environment. "The goal was a space where I could breathe, honestly, but also a place where I could produce, obviously. Art is just like any other business, you have to meet your goals, deadlines, be able to continually strive and aim for the stars. I wanted to be able to lounge around with no shoes on, but also create an environment that made productivity possible." Where are you based and how has that environment informed your work too? "I am based in Salt Lake City, Utah. Salt Lake has been really good to me. It has allowed me to follow my passion as an artist all while raising my three (now) teenage daughters in an environment that has multiple dimensions of culture. "It allows us to travel often, and to experience and explore so many different places. We have so many beautiful areas as well in Salt Lake from the desert to the mountains within a few hours, and I live right in the city. I pretty much have it all." What is your biggest inspiration? And how does this factor into your artwork? "My biggest inspiration is relating life back to the canvas through my art philosophy, which is the 'composition of imperfectionism' and how to embrace the wonder, rather than question it; the good, the bad, the evil, the weeds, the flowers, all of it. In the end, you look at it, and see beauty through it all, as a whole, on a canvas. "There are so many factors to the imperfections of life, and there are endless examinations all of which bring so much light. I will examine energy, color, space, and landscape through tempered abstraction. By applying abstraction, my hope is to construct intense personal moments that lure viewers to see beauty in this imperfect and perfect creation." "Currently, my favorite piece, which I can't display, is a piece I just finished for a 20-year wedding anniversary. I was contacted out of the blue by a husband who knew that his wife admired my work. He gave me 23 points of reference from their 20 years together along with images of their loft. What a fascinating portrait of a time, and it couldn't be more perfect, yet we all know how imperfect marriage can be. She will be so stunned, and what an incredible, sentimental gift to offer. I was and I am still blown away by his sweetness." "The light and the natural white balance that it offers to me. It is a place that feels really peaceful. I can have a million things on my mind and life can be chaotic, but once I step foot into my studio it's just me, my art, and the universe as one." This is where Addi lets her creativity flow without distractions. Some of Addi's essentials for creating her paintings. Addi's work plays on the imperfections of life as can be seen here with her abstract paintings. Maintaining a studio that is one part showroom and one part artist playground is important for Addi. Business in the front, party in the back. The minimal white background anchors the room and helps the artwork stand out.